Marcus Miller, with his groundbreaking style and trademark sound, has created a unique musical voice whose influence on modern bass players is unequaled. For decades, Marcus has refined and strengthened that voice not only by cultivating his technique but also by embracing innovation and employing the best tools available. When Marcus felt the need to evolve his strings, he came to Dunlop. Starting with their Super Bright formula, Dunlop worked closely with him to develop strings that perfectly complement his sound - crisp and cutting with a big fundamental and powerful low end. 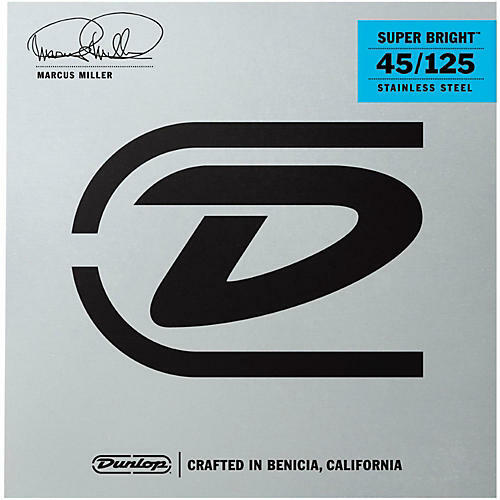 Like all Super Bright Bass Strings, Marcus Miller Super Bright Strings provide lighter tension for superior response to playing nuances, and the silky smooth feel of each string provides superior playing comfort. With extra-long life and exceptional string-to-string balance, these strings allow the natural voice of your bass to come through.